Quaint shops and cosy cafes set amongst a blend of intricate spires, domes and towers are some of the first images of the Old Town in Vilnius that come to my mind. My friend once affectionately described it as "a chocolate box city of three-storey baroque buildings". With baroque dominating Vilnius Old Town is actually a diverse mixture of Gothic, Renaissance, Classical and post-modern buildings. I was fascinated by the authentic architecture that most of the streets preserved: Intimate courtyards, interesting gateways or pretty lanterns always catch your eye. I especially loved exploring the atmospheric lanes of the back streets. Here you can absorb the true unique spirit of medieval Lithuania. 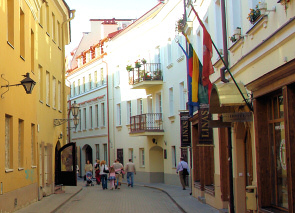 According to the history, in the Middle Ages, Vilnius was a blossoming city and one of the largest in Eastern Europe. Invited by Lithuanian Grand Dukes, merchants and craftsmen from Western Europe built their stores, workshops and inns in the Old Town area. Stikliu and Dominikonu are among the streets were medieval craftsmen used to live. 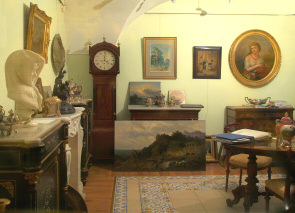 Nowadays you will find a number of antique shops there. 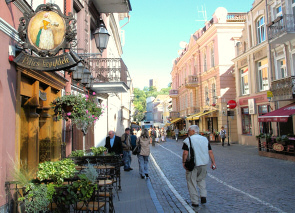 The main street for souvenir hunting is Pilies Street, running from Cathedral Square. There is a number of souvenir shops offering designer amber jewellery and linen clothes. Pilies Street is also the most popular for peaceful strolls with both locals and foreigners alike. It is a mainly pedestrian-only street. In summer time you will see musicians playing guitars or accordion. The outdoor pavement cafes are also very popular for enjoying local beers and watch the world go by. The last but definitely not the least Vilnius has an impressive collection of about 40 beautiful churches of different architectural styles. It’s always worth going inside to look at the splendidly decorated interiors. 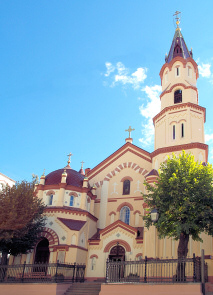 Beside Catholic churches you will find Russian Orthodox churches, synagogues and mosques. As I found out they were built because Lithuanian Grand Dukes tolerated other confessions. When Lija and I are planning a trip to Vilnius we prefer to stay in the Old Town. Beside being the most remarkable part of the city it is home for most of the main Vilnius attractions and also all the amenities are instantly available: restaurants and cafes, shops, bars and night-clubs. If you have a map of Vilnius or Vilnius City guide the Old Town is easy to explore, but If you wish to discover it in depth it’s worth going on a guided city tour.